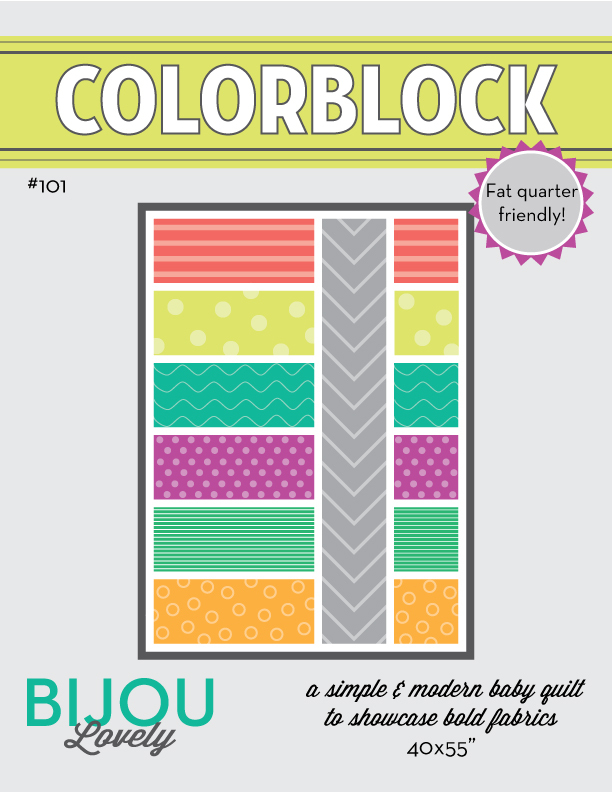 Bijou Lovely: improv mini quilt. I spent so much time sewing this weekend! It felt great to start crossing things off of my endless list of WIPs. 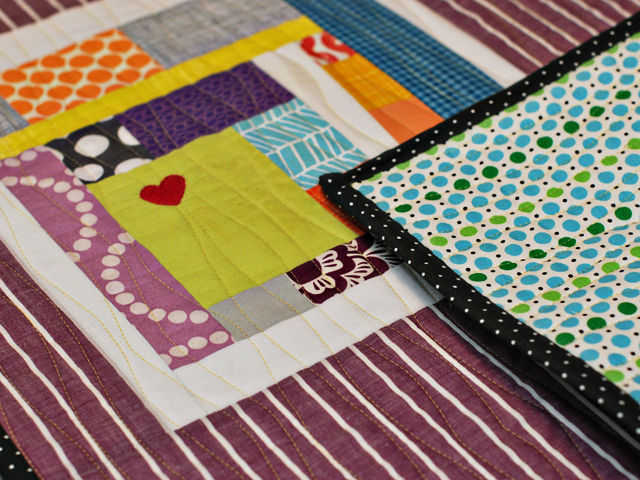 My first finish was this improv mini quilt, made from the block I made during the Improv Sewing class at Sewing Summit. 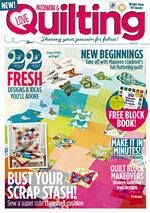 This one had been basted for awhile, but I had started pebble quilting it and it just didn't look right. 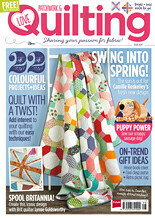 So it sat for a long time waiting to have the quilting ripped out. That part wasn't fun at all, but it was really easy and fast to finish once I had spent some quality time with my seam ripper. I used a thrifted purple shot cotton for the sashing, and I am really sad to say that I'm almost out of this fabric! It's got great texture and I love the look of the graphic stripe. 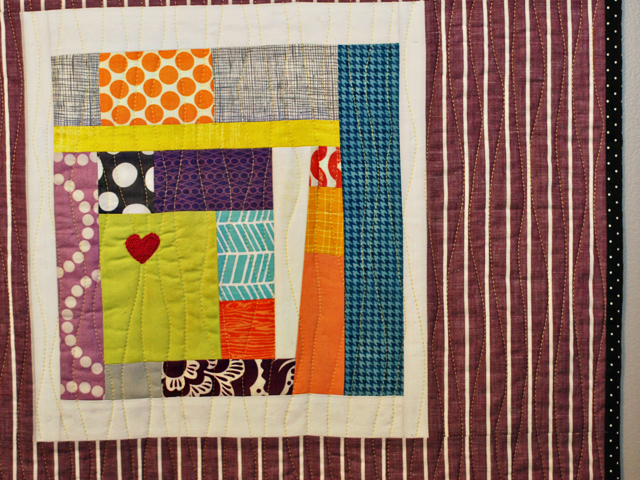 I quilted this in wavy lines using yellow Aurifil thread. It was my first time using Aurifil thread and I can say that I'm officially hooked. It makes such a difference, and my stitching turned out beautifully. I used a Denise Schmidt print from JoAnn's for the backing, and a black pindot for the binding. 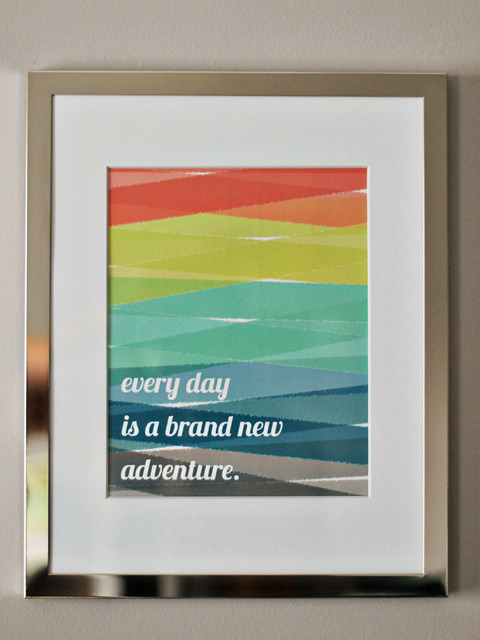 I wish I knew who made this print, I'm almost out and I want to buy more, it's so versatile! 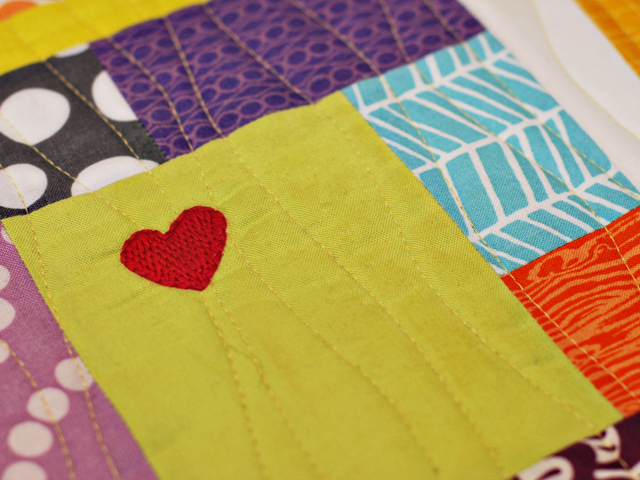 I handstitched a little heart on the quilt using a hot pink Cosmo floss, just for fun. 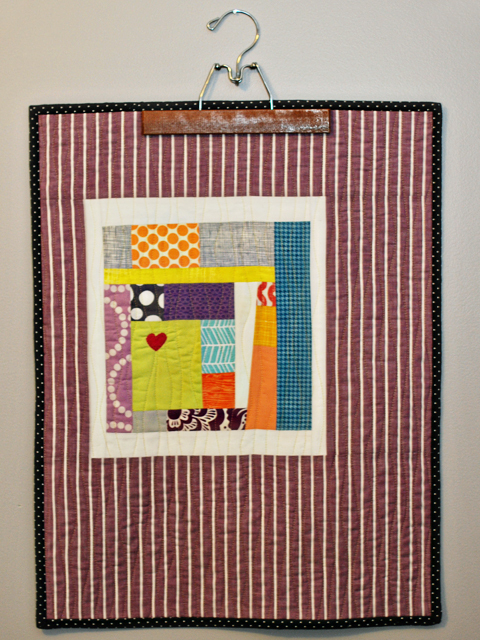 This one is hanging up in my sewing room! I'll probably move it to another wall once I finish another project I just started... a framed pegboard to hold all of my sewing tools and ribbon. We bought the supplies for that last night so hopefully I can finish it sooner than later. I have a bare wall that needs a little love! I'm looking forward to posting more of my finishes this week! Hope you're having a great Monday. I really love this mini!! The heart is such a sweet addition to your improv! So many thoughtful details. 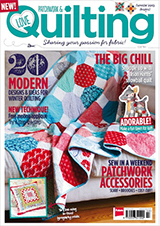 The quilting really does look great. I wonder what about it felt better to you with the new thread? 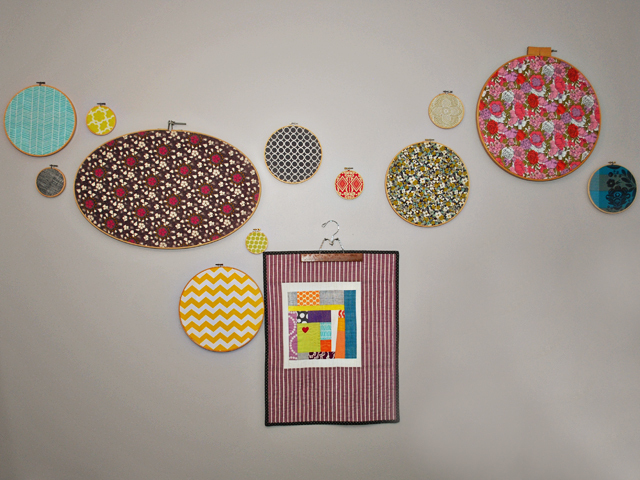 Your new peg board sounds like a great addition. Hope to see it soon! The heart is such a great little detail! 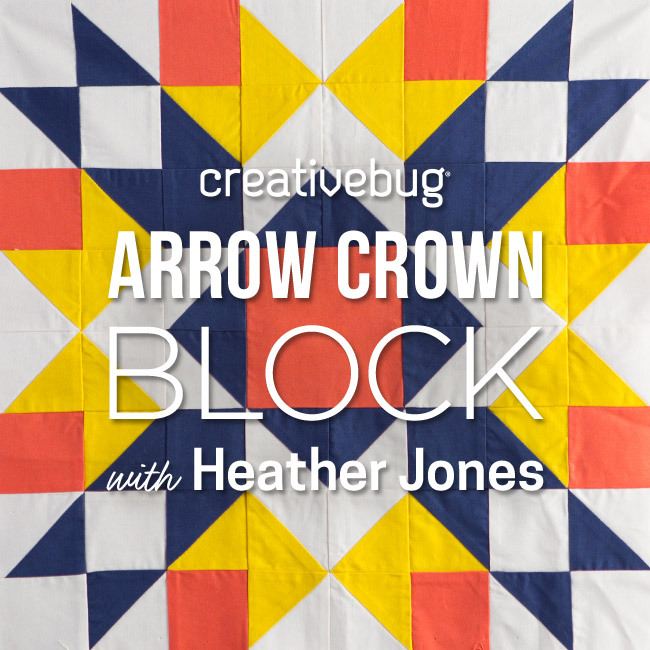 I love the outcome of this, and had forgotten that you hadn't finished a project with your improv block yet. Beautiful, Holly! So beautiful! 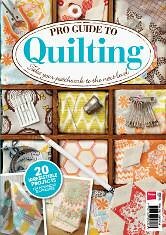 I wish I had the patience to learn quilting! I really love that improv block! The embroidered heart is so sweet, and finishes off this mini perfectly! 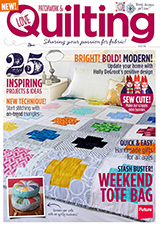 I'm new to quilting and working on a stripe quilt for my very first one. 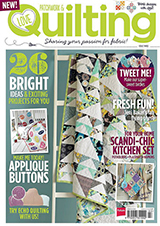 When you did the wavy quilting lines did you use a regular machine or a long arm? Love the contrast of the yellow and purple BTW! 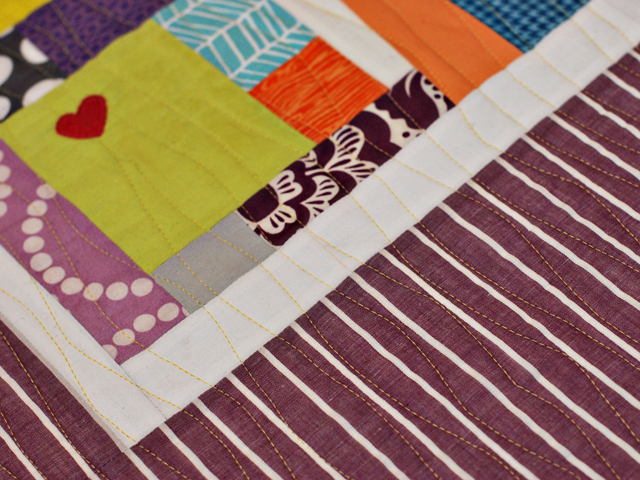 Chris-- I used my regular machine with a walking foot, and just kind of rocked the quilt back and forth to make the wavy lines! It's really easy once you get the hang of it! Quality time with the seam ripper is the worst, but this mini is awesome and I love the little heart!